As June was World Cup season for soccer, in a country like Japan, with such a love for its national team, the much televised matches were shown in literally every café, bar, and restaurant in Tokyo, where we had just begun our stay. 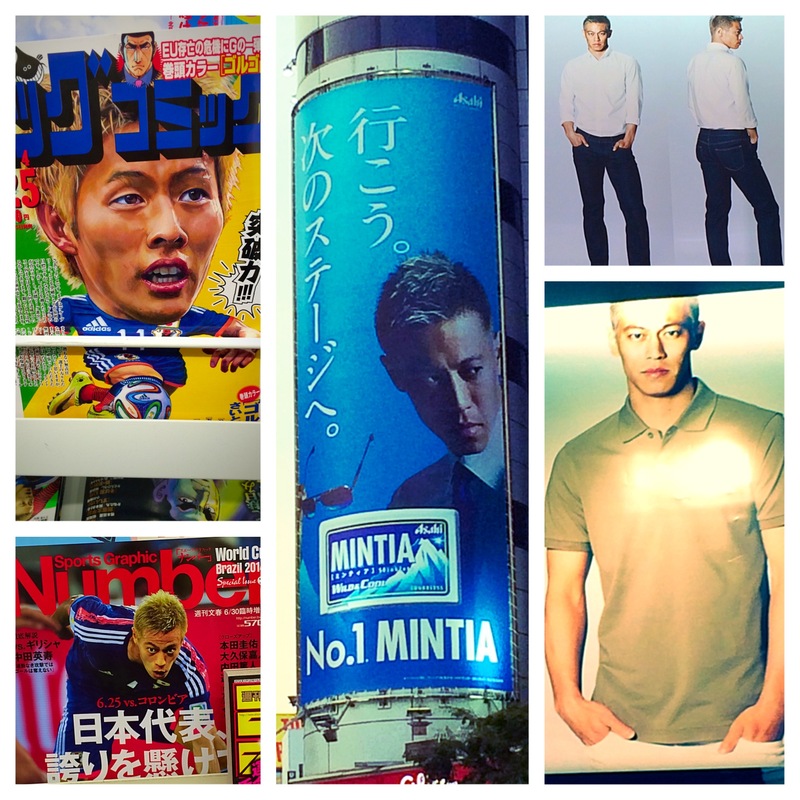 However, the actual games aside, as we walked the streets of Tokyo, from Shibuya to Akihabara, and even other cities such as Yokohama, one face stood out above all others as the singular symbol for Japanese soccer: Keisuke Honda. The star player of Japan’s 2014 team, with titles such as MVP under his belt, coupled with a uniquely rugged handsomeness and head of spiky bleach-blonde hair, Honda commands a presence that seems to jump out of every image. Honda in Akihabara, advertising a line of razors. However, when I first arrived in Japan, I had no idea the World Cup was even happening. What started this strange introduction to Honda, then, was a trip to Akihabara, where I saw his face advertising a line of razors. Soon after, at a local konbini (convenience store), I saw his face not only on the front of every sports paper and magazine, but also on a comic book and a poster and water bottles advertising the Aquarius water brand. I had no idea who Honda was, but I had never seen someone advertised so prevalently on so many different products before, so it became an interesting journey thereafter to find everything he was advertised on, and it was amazing the sheer number of things I found. 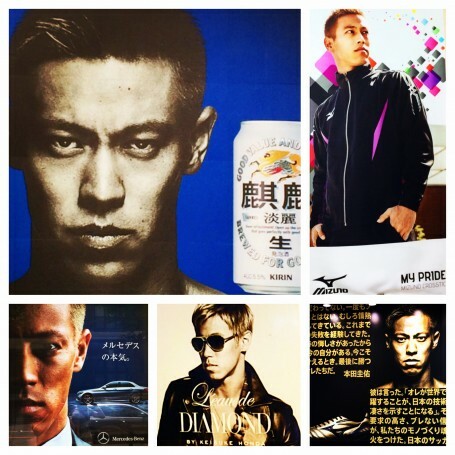 Ads, clockwise from top left: Kirin beer, Mizuno jacket, shoes, Diamond cologne, and a Mercedes car. Some of the things I found him on were a cologne, a towel for the Japanese soccer team, a Mercedes car ad, Aquarius water bottles (in three different collectible images), Aquarius posters and cups, on a game in an arcade, on a poster for a Mizuno jacket, on giant billboards in Shibuya for both beer and Mintia mints, on the cans of two different brands of beer, on ads for both pants and shirts in Uniqlo, a sports shoe ad, a comic book magazine, and on the covers of at least five different sports related magazines and newspapers. In short, he really was literally everywhere. Ads, clockwise from top left: comic book, Mintia mints, Uniqlo pants, Uniqlo shirt, and sports magazine. 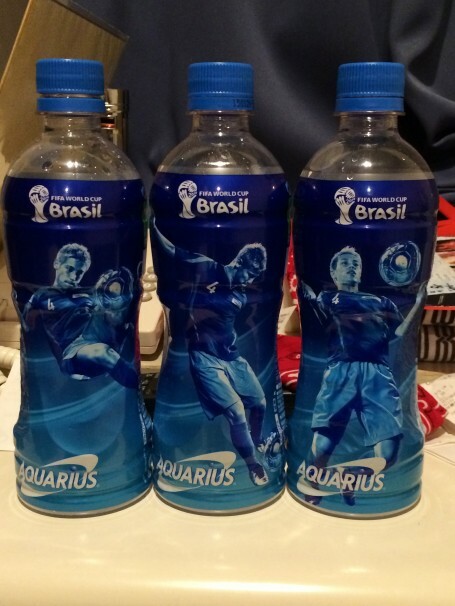 Aquarius water, sporting three versions of Honda! What really made Honda interesting to me, though, was how powerful he became through the strategic power of advertising. In a place like Japan, which utilizes every available space as an area to display and advertise, this method of constant visual repetition, prevalence, and recognition created a gradual sense of connection to him every time I saw his face somewhere in the city. I felt that I was slowly becoming more and more acquainted with him, even though I’d never watched a single soccer game in which he played. I believe this was exactly the point though–to quickly and aggressively foster a devoted connection to Japanese soccer through Honda in the most effective way possible by complete saturation of the visual landscape, where, no matter where you are, Honda’s image is always nearby as a constant reminder. Also, this method of association made me more drawn to the products he was featured on, as they took on an intangible sense of Honda/Japanese-ness that made them somehow more appealing, as though through these items, I was buying into not just Honda, but also the Japanese team, and by extension, a unique aspect of Japanese pop culture itself. Ads, clockwise from top left: Aquarius billboard, Aquarius poster, Aquarius water bottles, Kirin Beer, and Japanese team towel. However, after Japan’s team was out of the running for the World Cup, it was interesting how quickly Honda’s face disappeared. 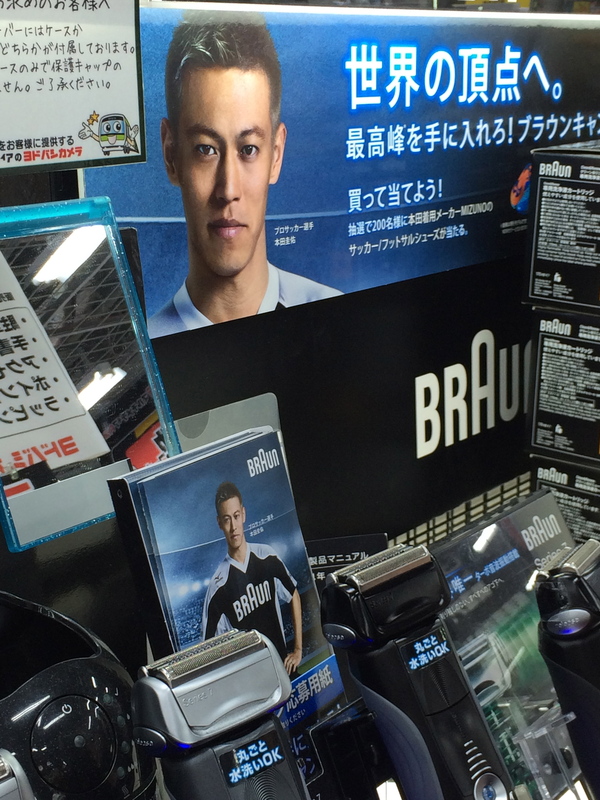 In the U.S., I’m used to seeing ads and promotional items up long after the relative event has passed, but in Japan, within just days after Japan’s team had failed to advance to the next stage, Honda had already become immensely less prevalent. I visited a store in SkyTree mall barely a week after going there and seeing an entire section devoted to Honda and the Japanese soccer team, only to find all the merchandise gone, and the entire section dismantled and filled with products for a new program. Also, in every konbini I went into, the special Aquarius promotional water that Honda’s image had been on was the only drink missing, when just a week or so before, those bottles of water were practically ubiquitous. I felt that this really spoke to the Japanese advertising mentality, where even an entire empire of endorsements and imagery can be built up and then dismantled on command, and how this is driven relentlessly by the push for the most up-to-date things. 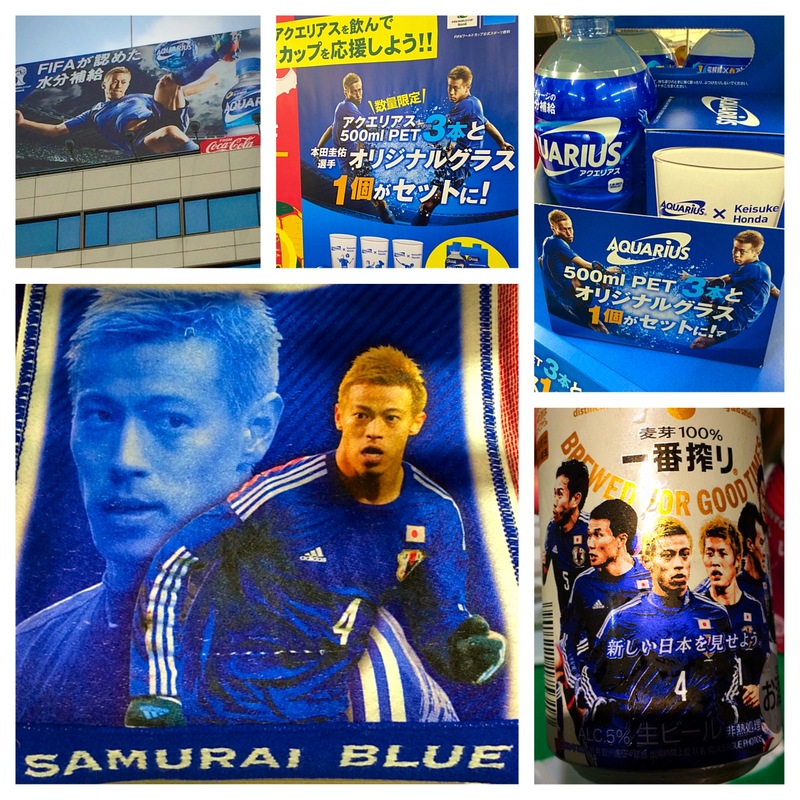 As valuable and loved as Honda is in Japan, after Japan lost, most things associated with him or the national team quickly became “old news” in this sense, and seemed to thus become relegated to the periphery. Only time will tell if Honda will emerge again on the billboards and windows of Japan as the symbol for Japanese soccer, but what is clear is that should Honda emerge again as the chosen player to advertise, you can expect without a doubt to find him on every corner, store, and billboard, the ultimate reminder of Japanese advertising, and the power of an image.